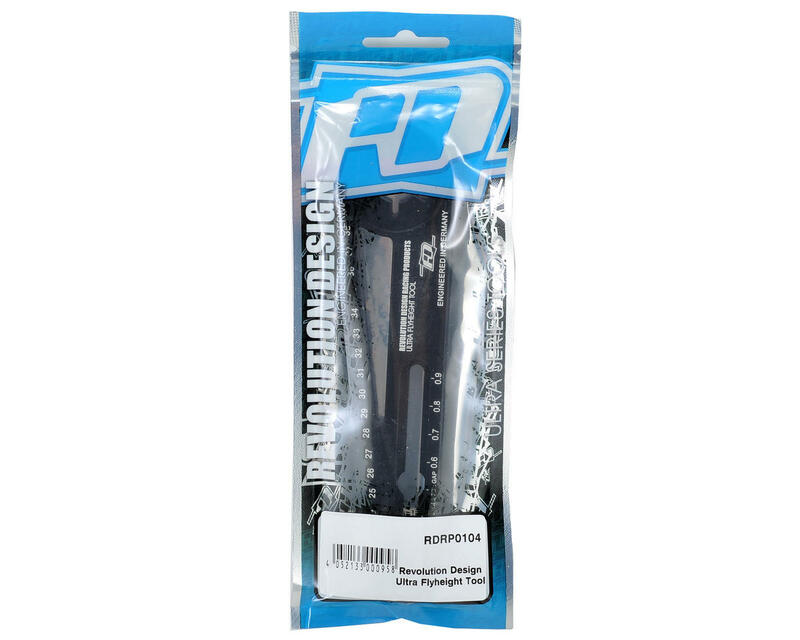 This is the Revolution Design Racing Products Ultra Flyheight Tool. 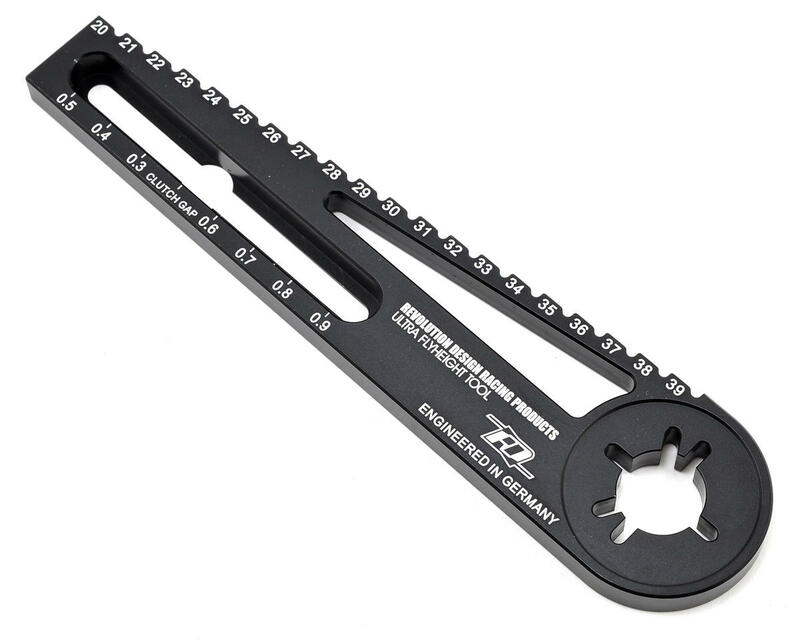 The RDRP Ultra Flyheight Tool is a great multi-use tool for nitro buggy and truck racers. This unique tool combines a flywheel wrench, a clutch gap gauge and a ride height gauge all into one compact tool. The tool will securely hold 3-pin and 4-pin flywheels while fastening the clutch nut and once the flywheel and the clutch bell are fitted you can then measure and adjust the clutch bell play using the clutch gap gauge. This handy feature let's you measure the axial play between 0.3mm and 0.9mm in 0.1mm increments. In addition, you can also measure the chassis ride height in a range of 20mm up to 40mm in 1mm increments by simply placing the tool underneath the chassis plate. The tool is finished in the standard RDRP black anodising with laser-etched markings that give the unmistakeable Revolution Design factory look. GOOD BUY HIGHLY RECOMMENDED SO USEFUL WHEN RE-BUILDING YOUR CLUTCH SYSTEM AND ALSO VERY HANDY ON THE TRACK FOR YOU RIDE HEIGHT ADJUSTMENT! This is a nice tool. BUT does not work with Losi 8ight clutches. The design of the clutch doesn't allow you to use the the clutch pin side of it or the clutch gap gauge. Only good for the ride height gauge but it also only goes up to 39mm which is no good for truggy as ride height is usually a little higher than the gauge measures.